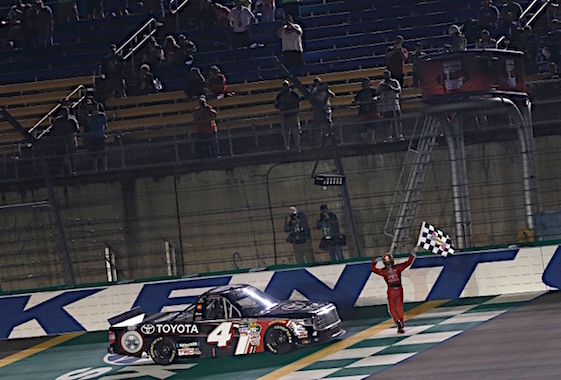 Christopher Bell survived an accident and an early spin to win Thursday night’s NASCAR Camping World Truck Series race at Kentucky Speedway. Bell picked up his third victory of the season, his first at Kentucky and the fifth of his career, holding off runner-up Brandon Jones by .187 seconds at the end of a closing 32-lap green-flag run. That mistake came on Lap 27, with Bell sliding out of control in his No. 4 Kyle Busch Motorsports Toyota. But by the time divergent pit strategies sorted out for a restart on Lap 83, Bell was back at the front of the field. Jones had his own issues, going a lap down after NASCAR penalized him for failure to line up in proper position for a restart. But he returned to the lead lap with a free pass as the highest scored lapped car and took the fight to Bell for the final 35 laps of the race after passing John Hunter Nemechek for the second spot on Lap 114 of 150. During the final 10 laps, Jones closed to the rear bumper of Bell’s Toyota, but couldn’t find a way around his rival. Rookie Justin Haley finished third, followed by Austin Cindric and Stage 2 winner Noah Gragson, who passed his boss, Kyle Busch, in the closing laps to nail down the fifth spot. Defending series champion Johnny Sauter finished ninth and retained the series lead by 28 points over Bell. Kentucky native Ben Rhodes won the first 35-lap stage, but elation soon turned to abject disappointment after a restart on Lap 42, after Rhodes made a pit stop and took the green flag in 13th. On the restart lap, Rhodes made a move on the bottom, creating a three-wide logjam with Christopher Bell in the middle and TJ Bell on the outside. The trucks ran out of room as they entered Turn 3, with Christopher Bell moving down slightly on Rhodes’ Tundra, which had gotten loose entering the corner. Rhodes spun up the track into the path of ThorSport Racing teammate Grant Enfinger, and both trucks were destroyed in the collision. “I was underneath the 4 (Bell) trying to make a move,” Rhodes said. “Then I saw him start to come down on me so I started backing out, and as we were going down to the groove we just all ran out of room. I was trying to give everybody as much room as I could. Just unfortunate. I know all the restarts everybody was going as hard as they can. For Enfinger, the wreck ended a string of four straight top-five finishes. (2) Christopher Bell, Toyota, 150. (16) Brandon Jones(i), Chevrolet, 150. (10) Justin Haley #, Chevrolet, 150. (13) Austin Cindric #, Ford, 150. (11) Noah Gragson #, Toyota, 150. (27) Kyle Busch(i), Toyota, 150. (30) Parker Kligerman, Toyota, 150. (4) Matt Crafton, Toyota, 150. (1) Johnny Sauter, Chevrolet, 150. (18) Austin Hill, Ford, 150. (3) Chase Briscoe #, Ford, 150. (29) Stewart Friesen #, Chevrolet, 150. (15) Ross Chastain(i), Chevrolet, 150. (20) Regan Smith, Ford, 150. (14) Cody Coughlin #, Toyota, 150. (6) Myatt Snider, Toyota, 149. (25) JJ Yeley(i), Chevrolet, 149. (9) John H. Nemechek, Chevrolet, 148. (21) Wendell Chavous #, Chevrolet, 145. (23) Josh Reaume, Chevrolet, 144. (22) Jennifer Jo Cobb, Chevrolet, 142. (32) Austin Wayne Self, Toyota, 130. (8) Ryan Truex, Toyota, Accident, 114. (12) Kaz Grala #, Chevrolet, Accident, 114. (24) Jordan Anderson, Chevrolet, Suspension, 62. (19) TJ Bell, Chevrolet, Accident, 54. (5) Ben Rhodes, Toyota, Accident, 41. (7) Grant Enfinger #, Toyota, Accident, 41. (28) Matt Mills, Chevrolet, Accident, 20. (26) Camden Murphy, Chevrolet, Electrical, 10. (31) BJ McLeod(i), Chevrolet, Overheating, 1. (17) Norm Benning, Chevrolet, Engine, 0. Average Speed of Race Winner: 112.703 mph. Time of Race: 01 Hrs, 59 Mins, 47 Secs. Margin of Victory: 0.187 Seconds. Lap Leaders: J. Sauter 1-26; G. Enfinger # 27-31; B. Rhodes 32-36; J. Haley # 37-40; N. Gragson # 41-72; M. Snider 73-76; C. Bell 77-92; John H. Nemechek 93-108; C. Bell 109; John H. Nemechek 110-113; C. Bell 114-150. Leaders Summary (Driver, Times Lead, Laps Led): C. Bell 3 times for 54 laps; N. Gragson # 1 time for 32 laps; J. Sauter 1 time for 26 laps; John H. Nemechek 2 times for 20 laps; G. Enfinger # 1 time for 5 laps; B. Rhodes 1 time for 5 laps; J. Haley # 1 time for 4 laps; M. Snider 1 time for 4 laps.